Q1. What photo, music,and video formats does the Media Player support? Ans. Photo: JPEG Music: MP3 Video: MPEG1, MPEG2, MPEG4. Q2. What memory card types are compatible with the frame? Q3. How do I store music files? Ans. Transfer the MP3 file to the memory card using a Memory Card Reader. Q4. My memory card is not compatible with the slot, what can I do? Ans. You should be able to buy a memory card adapter that is compatible with one of the supported memory cards. For example, if you own an XD memory card, you can buy an XD to CF adapter and then insert it into the slot. Q5. Does the Media Player have built-in/onboard memory? Ans. No. The Media Player does not have any internal memory to store media files. You need to use a compatible memory card to store media files. Q6. Can I insert multiple memory cards at the same time? Ans. Yes. When you have more than one memory cards, the screen will show all types of card have been inserted. Use the remote control to select which card's media you wish to view. Q7. What is the maximum picture size Media Player can display? Q8. Does the Media Player play every type of AVI video file? Q9. What is the optimal display resolution for the Media Player? Ans. The Media Player's optimal display resolution is 720x480. Q10. Can I play MPEG-I and MPEG-II files stored on media formats other than Compact Flash? Ans. You can play MPEG-I files properly on any supported media card. You may be able to play MPEG-II files properly if they are capable of high speeds. Q11. Can I rotate the picture on the screen? Ans. Yes. Simply press the rotate button on the remote control to rotate the frames display. * please note that the rotated picture will return to it's original orientation for the next picture. Q12. How do you access the slideshow mode (plays MP3 audio files while cycling through your digital pictures)? Ans. Simply press the slideshow button on the remote control. Q1. What is Digital Signage? Ans. DIGITAL SIGNAGE refers to the use of digital technology to send messages and images to displays in places frequented by the general public or specific groups. As we look around our daily environment, it is obvious that there are more and more digital messages around us. In the retail stores, digital signage is an electronic form of point-of-sale information- to replace posters, flyers, leaflets, and the other traditional marketing materials. The content may inform customers, entertain them or guide them to certain purchasing decisions. Above all, it must enhance the quality of their shopping experience. Q2. Why use Digital Signage? Q3. How does digital signage work? ‧ Control PC (server) sends digital media contents via Intra/Internet and uses dedicated software to remotely manage content updates, schedule changes, and compliance reporting. ‧ The Playback devices (clients) store digital content locally in HDD or Flash Disk. ‧ The media playback appliance deliver the output signal to a digital display (LCD). Q4. 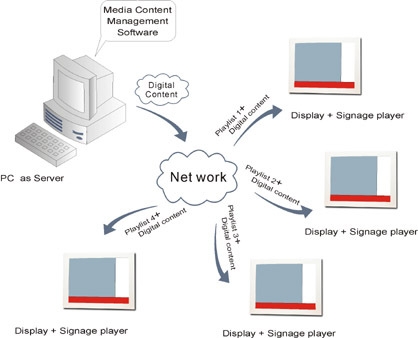 How does digital signage work? Ans. DIGITAL SIGNAGE is the best tool for those who are looking for a way to increase brand awareness and increase sales among supermarket shoppers. While customers are looking for their favorites in aisle or queuing for check-out, it is a great time to draw their attention to what message store wants to send. Other places such as shopping mall, museum, and elevator are all excellent for digital signage applications. Q5. What digital signage solution does Winmate provide? Ans. Currently Winmate has Media Player and Network Player Plus in digital signage product line. Q6. Which digital signage products support split screen? Ans. Network Player Plus system support split screen display. Q8. What media format does Media Player//Network Player Plus support? Ans. Use software to transform video format to AVI or MPEG. Q9. How to update media content? Q10. Does Network Player Plus support Macromedia Flash? Q11. Which one can I add motion detect? Ans. Motion Detect is only available in Media Player. Q12. What is the operation temperature? Q13. Can I update media content through wireless LAN? Ans. Yes. For Network Player Plus, as long as you have wireless module installed. Q14. Can I use widescreen (16:9) display for media playback? Q15. What panel size is available in digital signage products? Q16. What panel size is available in digital signage products? Ans. 512MB is the standard storage for Network Player Plus.Bigger Capacity CF card and 2.5” HDD are also available upon request. Q17. Is controlling software included in the package? Ans. Yes. Software used to edit media playlist and transfer is included in Network Player Plus package. Q18. Is API library available in all digital signage products? Ans. No. Winmate only provides Network Player Plus API library to customer. Q19. What is the max resolution supported in Media Player/Network Player Plus? Ans. It basically depends on the resolution that your panel supports. Q20. What is optimal Size of my CF card?